"International financial organizations ought to get down to dealing with this, to ensure Ukraine's financial and economic stability," foreign ministry spokesman Hong Lei told a daily news briefing. Russia accused Ukraine on Wednesday of violating international conventions and putting lives at risk by preventing Russian pilots and crew disembarking after passenger flights to Kiev. Citing information from Russian carrier Aeroflot, the Foreign Ministry said Ukrainian border officials were not allowing crews to rest in compliance with flight safety regulations when they flew to the Ukrainian capital. Earlier this week, the ministry issued statements saying Russians had been targeted by Ukrainian nationalists in two robberies and accusing the Ukrainian authorities of being unable or unwilling to prevent the incidents. Moscow has used reports that ethnic Russians in Ukraine are under threat from nationalists as part of its justification for annexing the Crimea region. 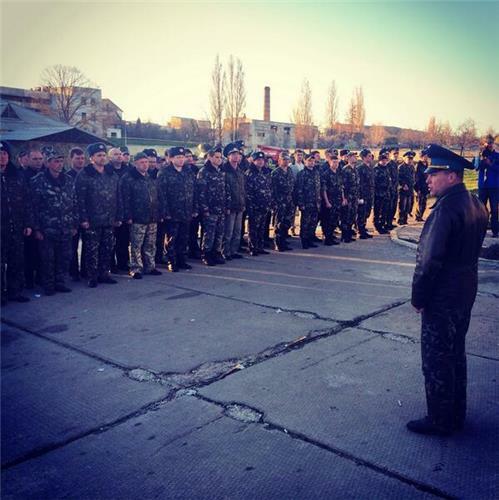 Russia has also reserved the right to use its armed forces to protect compatriots in Ukraine. U.S. Senate Democrats agreed on Tuesday to drop language outlining reforms of the International Monetary Fund from a Ukraine aid bill to increase the odds it will get through Congress, said Majority Leader Harry Reid, after weeks of partisan bickering that had delayed the package. Reid cited stiff opposition to the IMF reform provisions in the Republican-led House of Representatives. "A majority of the Senate would have liked to have gotten that done with the IMF in it, but it was headed to nowhere in the House," the Nevada Democrat told reporters. The Senate bill backs a $1 billion loan guarantee for the government in Kiev, provides $150 million in aid for Ukraine and neighboring countries and requires sanctions on Russians and Ukrainians responsible for corruption, human rights abuses or undermining stability in Ukraine. Backers of the bill want it passed to help shore up Ukraine's economy and to send a message to Russian President Vladimir Putin to discourage him from moving further westward into Ukraine or other neighboring countries. The legislation is now expected to pass through Congress relatively quickly and be sent to President Barack Obama to sign into law, as long as another simmering dispute - over whether to include increased natural gas exports in the bill - does not hold it up again. The House of Representatives' Foreign Affairs Committee passed its version of a largely similar measure earlier on Tuesday, paving the way for its consideration by the full House. Reid also said the compromise Senate bill could come up for a vote by Wednesday. Former President Jimmy Carter joins Consider This host Antonio Mora to discuss how President Barack Obama and his allies should respond to the Ukraine crisis. U.S. President Barack Obama said on Tuesday that Russia's annexation of Crimea was not a "done deal" as it has not been recognized by the international community. He added that Washington was concerned about the possibility of further Russian encroachment into Ukraine. "It is up to Russia to act responsibly and show itself once again to be willing to abide by international norms and ... if it fails to do so, there will be some costs," he said at the end of a nuclear security summit in The Hague. He said additional sanctions would hurt Russia, but also the economies of other countries. Obama’s case seems to be that Russia’s actions will be self-defeatingly so it’s fine that the U.S. can’t do anything. Not super satisfying. After a reporter questioned America's power on the international stage, Dutch Prime Minister Rutte came to the country's defense, saying there is no global conflict that can be solved without the involvement of the United States. Take that Putin: Obama: "Russia is a regional power "
President Obama was asked if the United States' influence was on the decline, with the reporter citing Putin's actions despite warnings from Obama. The point is that there are always going to be bad things that happen around the world and the United States, as the most powerful nation in the world, will be looked to for solution, Obama said, disputing the premise of the question. Russia is a regional power that is threatening some of its immediate neighbors, not out of strength but out of weakness, the president added. "I don't think it's a done deal" POTUS says of a Russian invasion of east Ukraine.Calls massing troops on border "an effort of intimidation"
It would be dishonest to suggest there is a simple solution for what has already taken place in Crimea, Obama said. 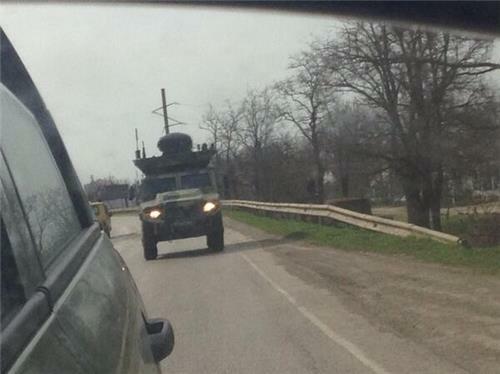 Switching gears a bit, Obama said the Russian troops that are on the border are on Russian soil and if they stay on Russian soil, the United States opposes what appears to be an act of intimidation but Russia has a right to have its soldiers on its soil. Crimea is 'not a done deal' in the sense that the international community largely does not recognize the referendum and annexation, Obama said, acknowledging that Russian forces do control much of the region. 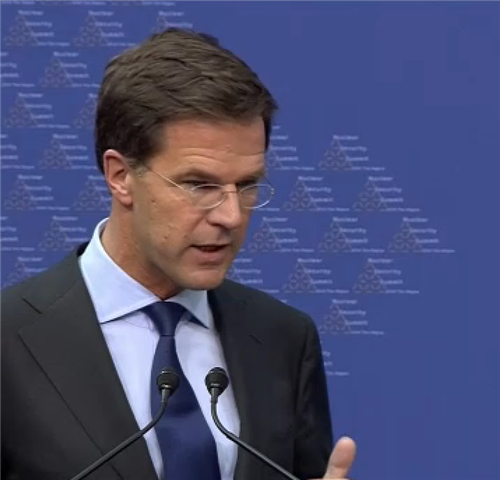 The European Union, the United States and the G7 are working very closely together, Dutch Prime Minister Rutte said, following Obama's comments. It's important that we spend as much effort on bolstering the economy in Ukraine and ensuring the elections go forward, Obama said. 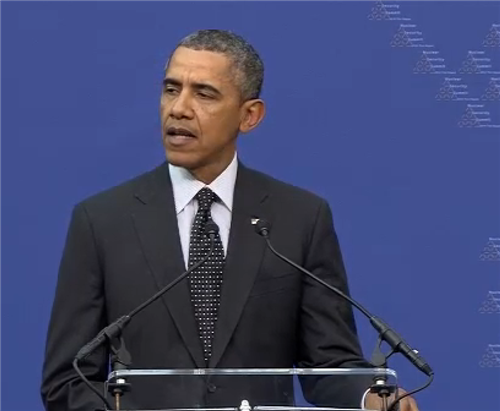 It is now up to Russia to act responsibly and show itself willing to act by international norms, Obama said. If it chooses not to do so, there will be further costs. Obama recognized those costs will have some impact on the international economy but the majority will be felt by Russia, he said. I'm less interested in motivation and more interested in facts and principles the United States and the entire international community is looking to uphold, President Obama said of Russian President Putin during his closing speech at the Nuclear Security Summit. It's always been our belief that Ukraine is going to have a relationship to Russia but that doesn't justify Russia encroaching on Ukraine, Obama stressed. Moving forward, we're not recognizing what has happened in Crimea — 'a referendum sloppily organized over the course of two weeks' — would be valid but the international community is concerned about further encroachment by Russia into Ukraine, Obama said. Russian banks may want to develop their business in Crimea, with VTB's Bank of Moscow most interested in expanding there, Kommersant newspaper reported on Tuesday citing sources. Moscow formally annexed Crimea last week and since then its forces have been seizing Ukrainian military bases. Russia's action has drawn strong criticism from the European Union and the United States, which have imposed sanctions mainly against Russian individuals. Kommersant reported that an option being considered for Crimea's banks could lead to a Russian bank establishing 300 branches in the region. Crimea has around 70 banks currently registered with the National Bank of Ukraine. The paper reported that Bank of Moscow, bought by Russia's second largest bank VTB in 2011, is showing the greatest interest in such a plan. It may not open branches under its own name, but through a subsidiary, the paper cited a source as saying. Bank of Moscow declined to comment. Crimean Deputy Prime Minister Rustam Temirgaliyev has been quoted by Russian media as saying Crimea will drop the Ukrainian hryvnia and adopt the Russian rouble in April, and will have a banking system completed by April 15. According to The Wall Street Journal, Russia may have hid its plans for Crimea by somehow evading U.S. eavesdropping. And now, U.S. intelligence officials are starting to blame Edward Snowden for that evasion, BuzzFeed reports. U.S. intelligence officials — in leaks to news organizations and quiet conversations in Washington — have begun to blame Edward Snowden for their failure to anticipate Russian aggression in Crimea. But several current and former intelligence officials said that the U.S. failure to see into Vladimir Putin’s plans is profound and long-running, and that there is little evidence that Snowden’s leaks allowed Russia to evade U.S. intelligence more effectively than it had already been doing. “The Snowden leaks had nothing to do with Ukraine,” Fred Fleitz, a former senior CIA analyst, told BuzzFeed on Monday. “Russia could have pulled this off without Snowden,” said another former CIA analyst. American foreign policy setbacks are inevitably followed by a round of Washington finger-pointing, a sport that is already well underway. Snowden “is clearly in Moscow under the influence of intelligence services for a country that is expanding its borders today using military force. I think there’s a lot more questions that need to be answered here,” House Intelligence Committee chief Mike Rogers, a leading CIA ally, said on Meet The Press Sunday. Oleksandr Muzychko, a notorious leader of Ukraine's protests, was killed late Monday, The Washington Post reports. Oleksandr Muzychko, an ultra-nationalist member of Ukraine’s recent protests who was wanted in Russia for alleged war crimes, was dragged from a car and shot dead late Monday in the western Ukrainian city of Rivne, local media reports. There were conflicting accounts of what happened to the man also known as Sashko Biliy. According to Ukrainian lawmaker Oleksandr Doniy, writing in a Facebook update,unknown assailants cut off Muzychko’s car just before midnight, bringing it to a halt. Muzychko, a bald bear of a man who led the ultra-nationalist group Right Sector, was dragged out of the car, cuffed, and shot twice in the chest. “Those who killed him made sure that he was not wearing a bulletproof vest and then shot him in the heart,” said Right Sector activist Yaroslav Hranitskiy, reports the Moscow Times. Interfax, the Russian news agency, said Muzychko opened fire on law enforcement officers. 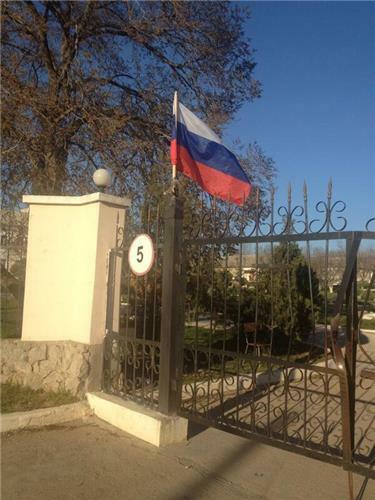 Crimea looks set to leave Ukraine for Russia. Farther north, unrest is growing in the mineral-rich Donbas region in eastern Ukraine. While separatism has traditionally held little sway in the area, economic stagnation, a weak government in Kiev and the lack of credible local leadership is pushing the region toward Russia and away from the Euromaidan movement favoring closer ties with the European Union. However, the building tensions are far more complicated and nuanced than a simplistic east-west, Russian-Ukrainian divide. The Donbas was one of the few industrial regions during the czarist Russian Empire. Peasants from linguistically diverse Russian-Ukrainian borderlands moved there to work in the mines and factories and embraced Russian language and culture. The Donbas later became instrumental to Ukrainian independence in 1991 after a massive wave of strikes in the region against Moscow’s ineffective economic policies. With promises from Kiev to better manage the economy, most people in the Donbas, including ethnic Russians, supported the 1991 independence effort. But political independence did not bring economic prosperity, leaving Donbas heavily dependent on the Russian market. Economic tensions, not just ethnic identities, are at the center of public debate about the future of the region. A bill providing economic assistance to Ukraine and imposing sanctions over Russia's actions in Ukraine cleared a procedural hurdle in the U.S. Senate on Monday, as backers attempted to win passage of the legislation later this week. By a vote of 78-17, the Senate laid the groundwork for debating a bill that would back a $1 billion loan guarantee for the government in Kiev, provide $150 million in aid for Ukraine and neighboring countries and require sanctions on Russians and Ukrainians responsible for corruption, human rights abuses or undermining stability in Ukraine. The measure also includes reforms to the International Monetary Fund that are opposed by many congressional Republicans and are not included in a version of the bill in the House of Representatives, which could complicate efforts to pass a Ukraine aid bill. The ships and hardware in the military bases that #russian troops took over get to keep that material from #ukraine , says @JenniferGlasse . President Obama has arrived in the Netherlands, according to The Associated Press and other reporters. The ongoing dispute with Russia is expected to dominate the agenda of the international meeting. 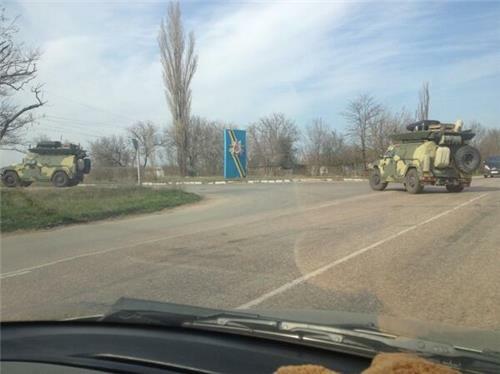 Russian troops forced their way into a Ukrainian marine base in the Crimean port city of Feodosia early on Monday, overrunning one of the few symbols of resistance left after Moscow wrestled the peninsula away from Kiev, defending soldiers inside said. The Russians used stun grenades and fired automatic weapons as they charged in, a Ukrainian military official said. 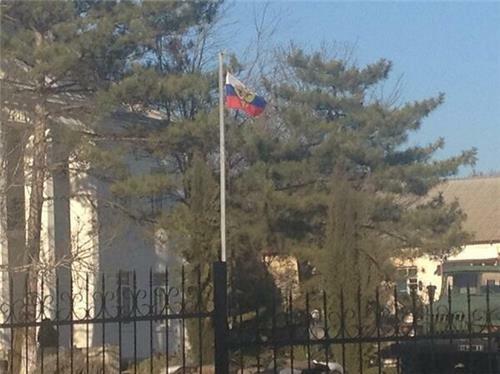 Ukrainian flags had been taken down from flagpoles inside the base. Ukrainian army officer, First Lieutenant Anatoly Mozgovoy, told Reuters by phone from inside the compound that the Russians had fired shots and the Ukrainian soldiers were unarmed. Asked if the base had been taken over, he said: "Yes". "The invading troops were using stun grenades and also firing automatic weapons. The interior of the compound is full of Russian troops," said Vladislav Seleznyov, a Ukrainian military spokesman in Crimea. Russian forces had already captured part of the base, used by the 1st Separate Marine Battalion, Ukraine's top military unit, earlier this month. But Ukrainians had previously appeared to be in control of the armory, the barracks and other facilities in the compound. Russia's seizure of Crimea, a Black Sea peninsula of two million people with a narrow ethnic Russian majority, has been largely bloodless. Moscow formally annexed Crimea on March 21 in a move not recognized by Kiev and the West, prompting sanctions on Russia over the Cold War-era style conflict. NATO's top military commander said Sunday that Russia had a large force on Ukraine's eastern border and said he was worried it could pose a threat to Moldova's mainly Russian-speaking separatist Transdniestria region. NATO's Supreme Allied Commander Europe, U.S. Air Force General Philip Breedlove, voiced concern about Moscow using a tactic of snap military exercises to prepare its forces for possible rapid incursions into a neighboring state, as it had done in the case of Ukraine's Crimea region. Meanwhile, Russia's deputy defense minister, Anatoly Antonov, said Sunday that Moscow is complying with international agreements limiting the number of troops near its border with Ukraine. Some pro-Russia types in Ukraine are very convinced by reports in Russian media that several U.S. states are also trying to secede.